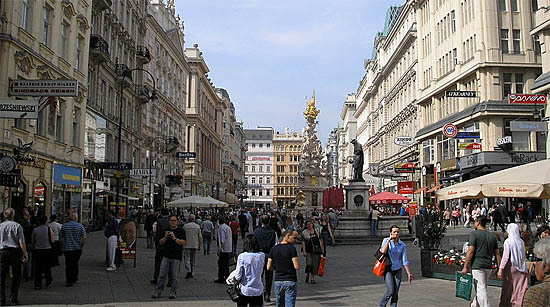 Der Graben (German, literally, “the trench”) is one of the most famous shopping streets in Vienna’s city centre. The Graben was a marketplace from the very beginning. Already in 1295 a fruit market is mentioned on the Graben. When you stroll through the Graben and keep your eyes open, you will discover many treasures in the shops, antique buildings, places and fountains. Many renowned international brands have their flag ship stores on the Graben. Luxury means different things to different people and yet the concept of uxury is the unifying element in the 1st district of Vienna. Those who seek luxury will find it on the Graben in abundance.